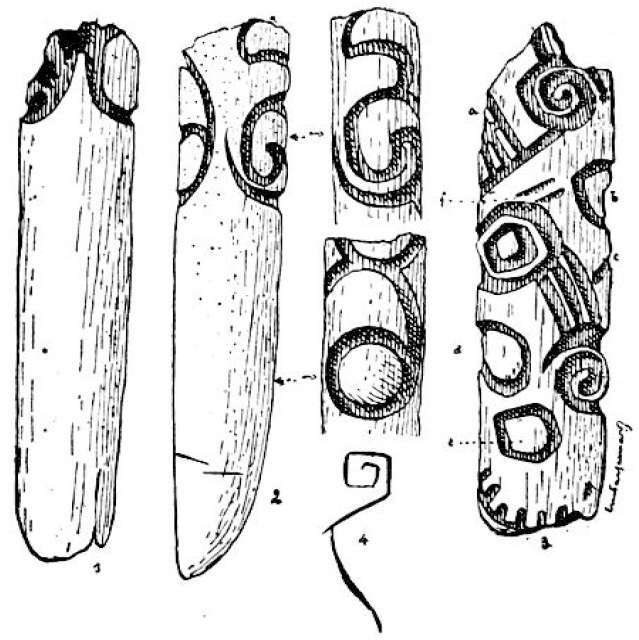 (left and right) Engraved baguettes demi-rondes from Isturitz. These are spear tips or points formed of two half-cylindrical rods of bone or antler glued together, often with deeply incised decoration. Note the wart-like projections on the left hand image, sometimes referred to as tubercles. Baguettes demi-rondes, known as ‘half-round rods’ (HRRs for short) in English, are a two-part composite projectile point technology usually manufactured from antler, though the occasional example made from bone or ivory has also been identified. In general, the HRR is made up of a pair of elongated plano-convex pieces which when fixed together (presumably in conjunction with a fixing agent) form a single whole with an oval section. While the distal (tip) end of the complete HRR point is cylindrical in section and designed for piercing as part of a spear point, the proximal (hafted) extremity may be of a number of different morphologies, including conical, bevelled, or fork-based. 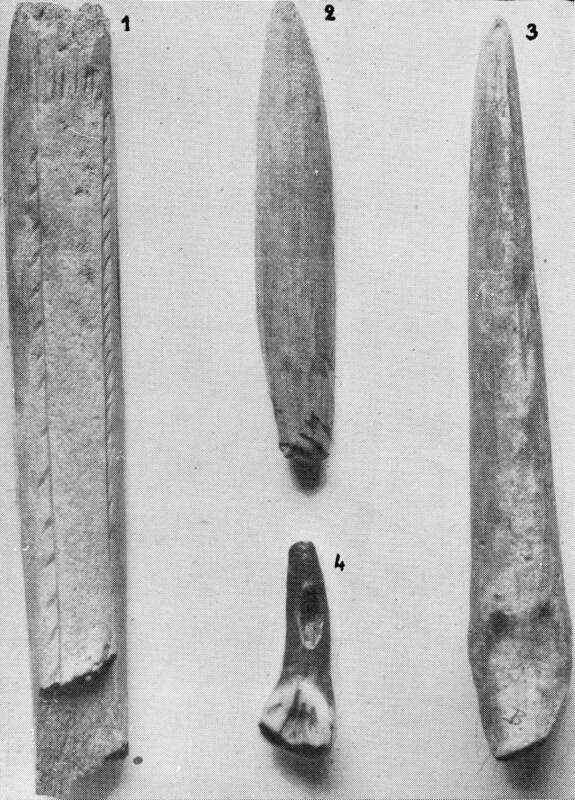 This method of point construction allowed the Magdalenian toolmaker to construct a projectile point of much larger proportions than the physical constraints imposed by the raw material (that is, antler beams) usually allowed. Having been reported since the early 20th century, this weapon type has long been considered as a 'fossile directeur' for the Middle Magdalenian (18 700 BP to 15 800 cal. 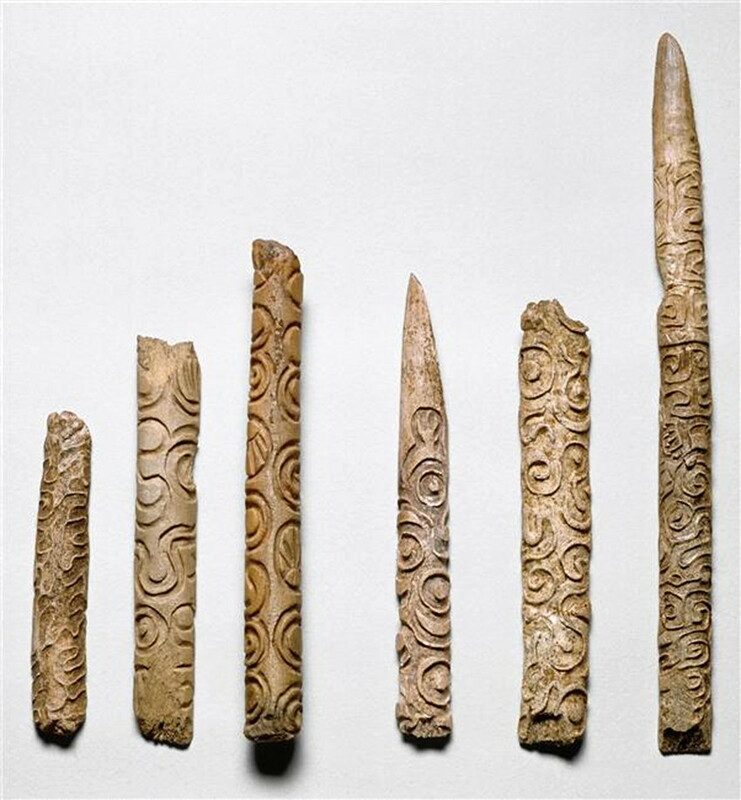 BP), though these artefacts are also known to appear (though in far less numbers) in early and late Magdalenian contexts . Recently, a number of HRRs from Isturitz were dated radiometrically with the dates falling between 17 100 - 15 800 cal. 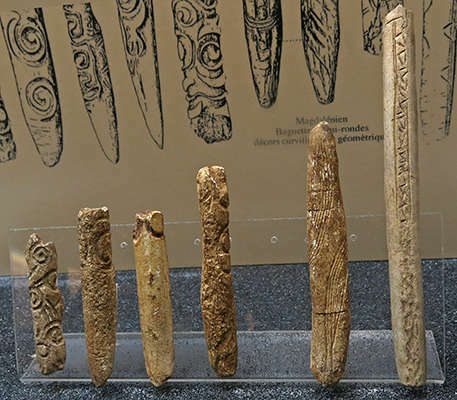 BP, confirming a late Middle Magdalenian attribution of this technology. 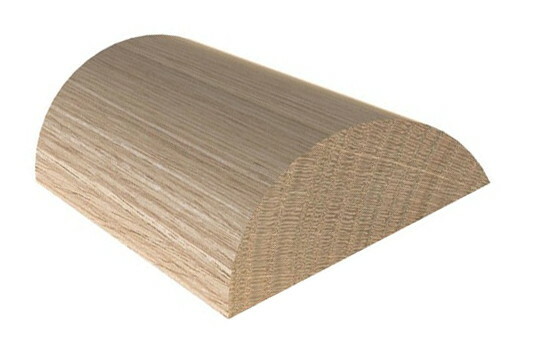 The term 'baguette demi-ronde' is unfamiliar and exotic sounding to most English speakers, but simply refers to a wooden strip used to cover joins in wall panelling. In English it is called 'half round rod', and is available from most hardware stores. Note that even for this purpose, this rod from a French supplier is not semi-circular, but has a width of 14 mm, but a depth of only 5 mm, not 7mm, which would be the dimension if it were semi-circular. Half round rod from an Australian supplier, 30 mm by 12 mm. Paired baguettes demi-rondes pieces from Isturitz. The 'flat' surface is in reality almost always concave. It is much less carefully polished than the convex side, and it reveals some parts of the spongy matter which forms the interior of the reindeer antler. The edges are slightly raised, and the middle, hollowed out as a shallow gutter, is marked by very irregular transverse streaks, made with a burin, without any pretense of keeping them parallel or equal, and which begin at one end and succeed each other, It should be noted that these striations are only the middle of the rod without reaching the edges. 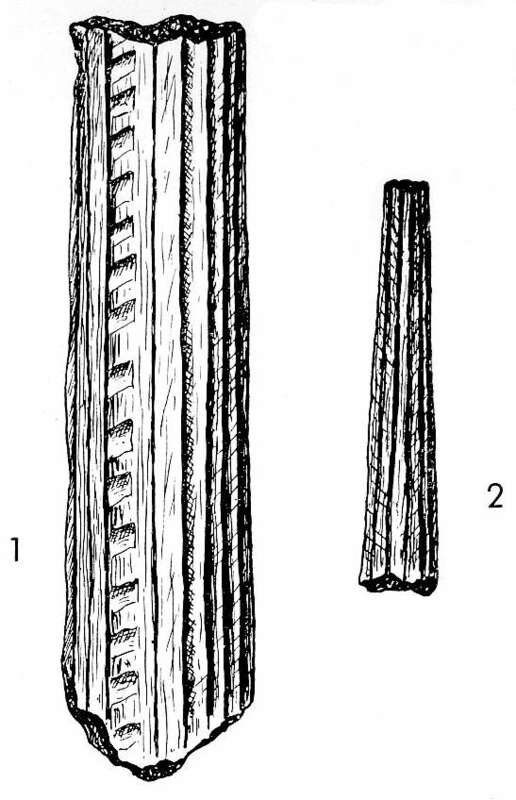 The two pieces were found still side by side, as they had been when in use. Originally, the object would have been 370 to 380 mm in length, with the largest width being 12 mm in the middle of the pair of the perfectly matched baguettes, with a maximum thickness of 6 mm, decreasing towards the ends. The two rods are, in most respects, identical and fit very well one on the other. Their convex faces are decorated with the same motifs, with the marked intention, not absolutely obtained, of achieving complete symmetry. The decorations, executed with a burin, are five in number and form two parallel patterns running along each side of the wand and petering out towards the ends. Not only have the two pieces been made for each other, but almost certainly they were made on each other. 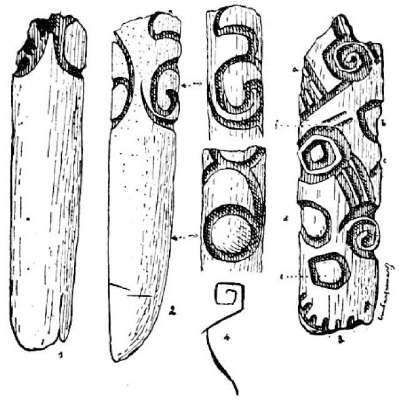 Once the two pieces were taken from the reindeer antler, possibly from alternate parts of the same reindeer antler, in order to obtain two profiles as similar as possible, the 'flat' faces were first ground flat, grooved, and then glued. Then began the exterior finishing which completely married them into an integral whole. Finally, the artist engraved the curious motifs that decorate their surface. The question then arises, why were they made in two parts? The answer is easy, on reflection: reindeer antler, the material which is almost exclusively used, is composed of a hard external layer, relatively thin, and of a spongy and unconsolidated interior. 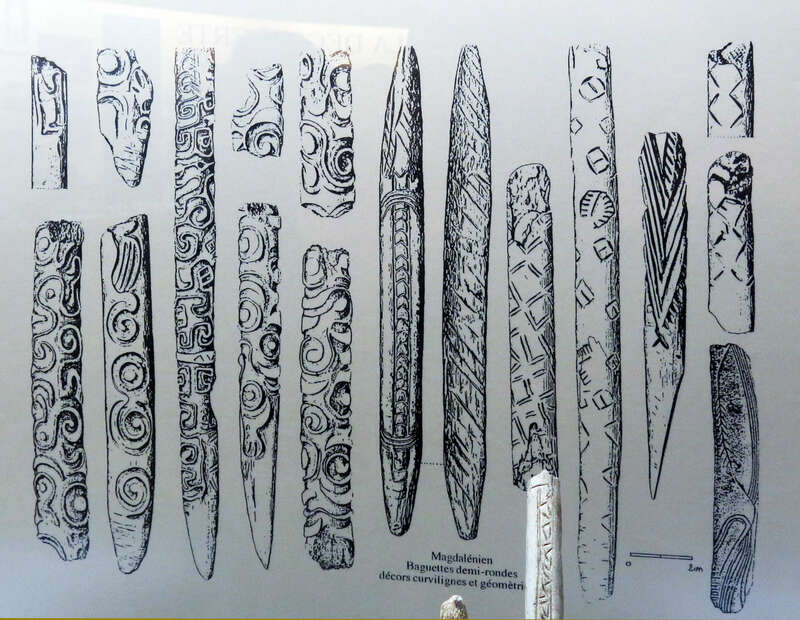 It is certainly because of the small thickness of the cortex that the Magdalenians were led to juxtapose two pieces, to obtain a greater strength and thickness, with two hard and durable faces which were, coincidentally, easy to decorate. Photo and text: adapted from Passemard (1916). 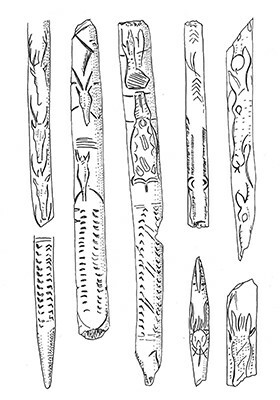 Baguettes demi-rondes composition with examples from the artefacts from Grotte de l’Abbé. A. Details of the superior and inferior face of a HRR component. B. Fixing of the two halves. 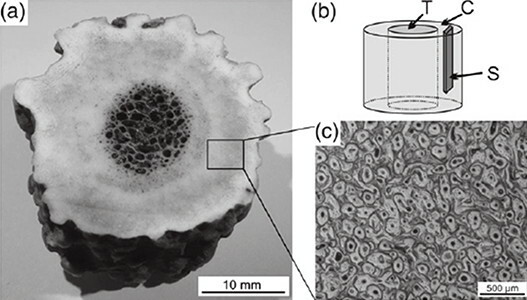 C. Morphology of a complete HRR point. The paired Baguettes demi-rondes pieces. A. Mesial-proximal fragment (GdA 20). B. Mesial fragment (GdA 19). Detail of engraved decorations in inset boxes. This cross section of a deer antler shows that more than one third of the diameter is taken up by the weak spongiosa, once we allow for smoothing of the outside surface. By using just the cortex we can get a very much stronger, stiffer, and narrow spear head, ideal for the purpose. Reindeer antler has a similar cross section, but the boundary between the spongiosa and the cortex is less well defined. 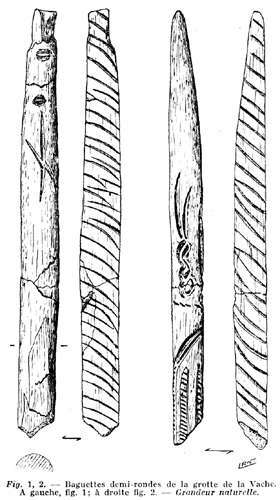 Reindeer antler, however, has longer, straighter sections from which to cut material for baguettes demi-rondes. For bone, the only suitable material is a long bone such as a femur. Here, the need for lamination is much more critical. In the section which is most likely to be used, there is a hollow section, the marrow cavity. It may well be that baguettes demi-rondes were first developed to make a tough, stiff spear head from bone, with the technique later being adapted for reindeer antler. 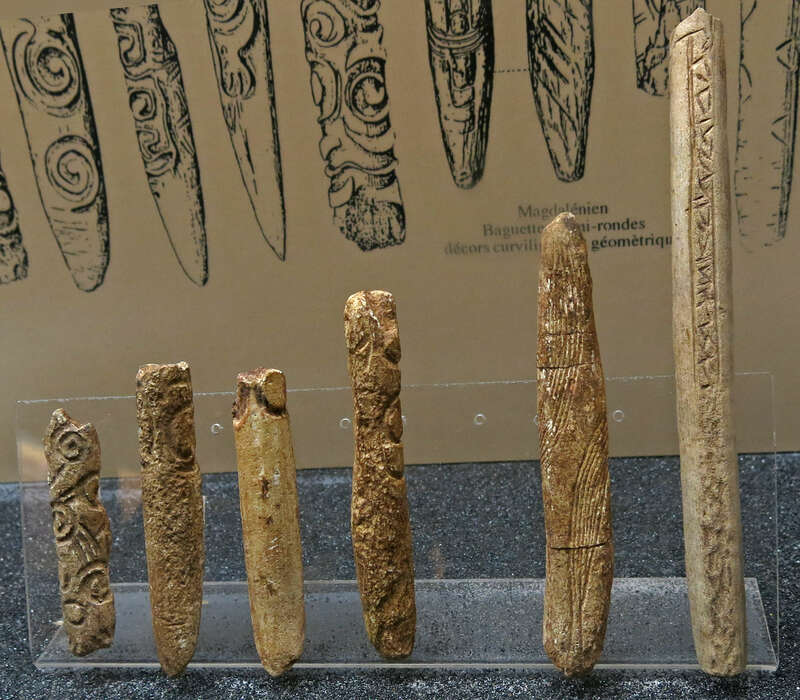 There are even baguettes demi-rondes made of mammoth ivory, which is a triumph of technique over the need for it - ivory can be chosen which is homogenous throughout its thickness and length. Why make Baguettes demi-rondes anyhow? Because they are very much stiffer and stronger! For this experiment, I went down to the local hardware store and got a length of half round rod. First I drilled a hole at one end, and marked a length of 38 cm, the length of the pair of baguettes demi-rondes from Isturitz, described by Passemard (1916), from the hole, along the length of the rod. Then I attached a weight of two kilograms to a string through the hole, and measured the deflection, which was 90 mm, as shown in the upper photograph. I then glued another piece of the rod to the first, and when it was dry I drilled through the original hole to complete the hole through the glued rods. The resulting rod was twice as thick as the original. 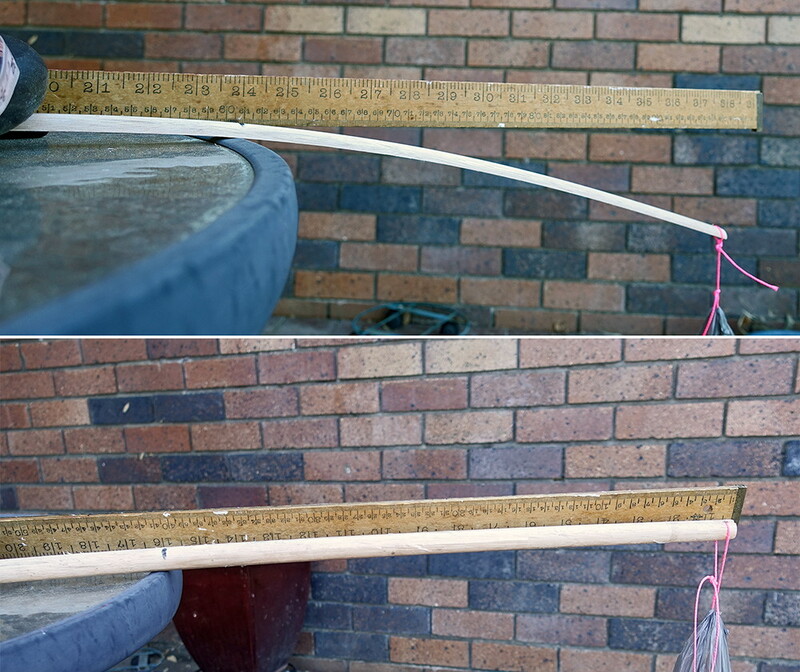 I then attached the same weight of two kilograms to the string through the hole, and measured the deflection, which was 8 mm, as shown in the lower photograph, though the deflection is so small that it is difficult to both measure and to capture in a photo. This gives an eleven times increase in stiffness or strength to the glued rods. I would have expected it to be only eight times (23 by mechanical theory) for double the thickness, but perhaps the glue made the rod thicker than it would otherwise be, and in any case it is within the bounds of experimental error. This method would thus have resulted in a very stiff and strong spear point, and like two ply yarn, any fault in one part is less likely to cause failure, since the accompanying section takes up the strain. 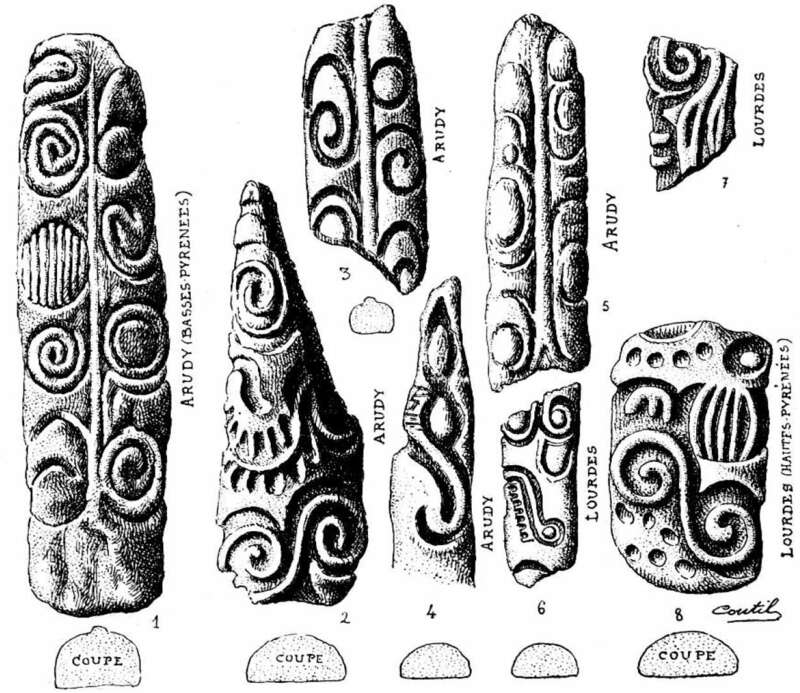 (left) Spirals on baguettes demi-rondes found at Isturitz. (right) For comparison, spirally decorated baguettes demi-rondes at Arudy in the Basses Pyrénées and at Lourdes, in the Hautes Pyrénées. 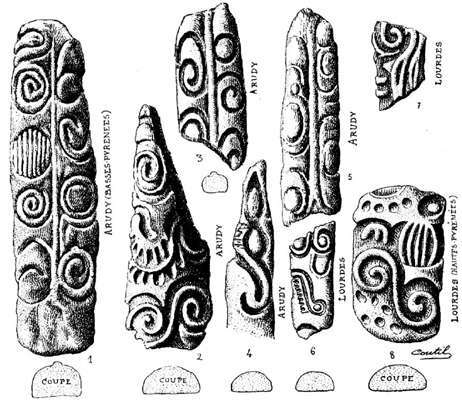 Baguettes demi-rondes engraved in spirals are characteristic of the Grotte d'Isturitz. 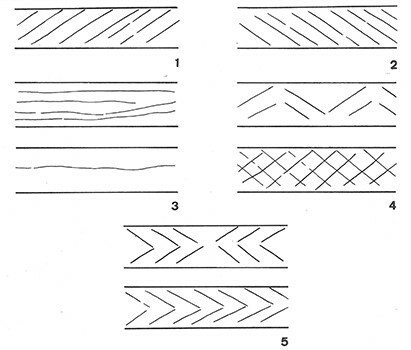 Decorations on baguettes demi-rondes from the layers of harpoons with a single row of barbs. 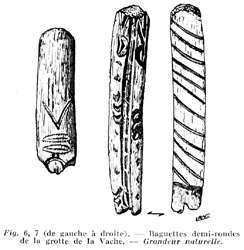 The baguette demi-ronde is a piece of cervid (deer) antler or more rarely bone or ivory of generally plano-convex section. Two faces are distinguished: the upper or dorsal face, the most convex always constituted of the compact part of the wood and bearing the eventual decor. The face that is opposed to it is the lower side or the venereal side which can bear traces of spongiosa. In most cases it receives a striation. 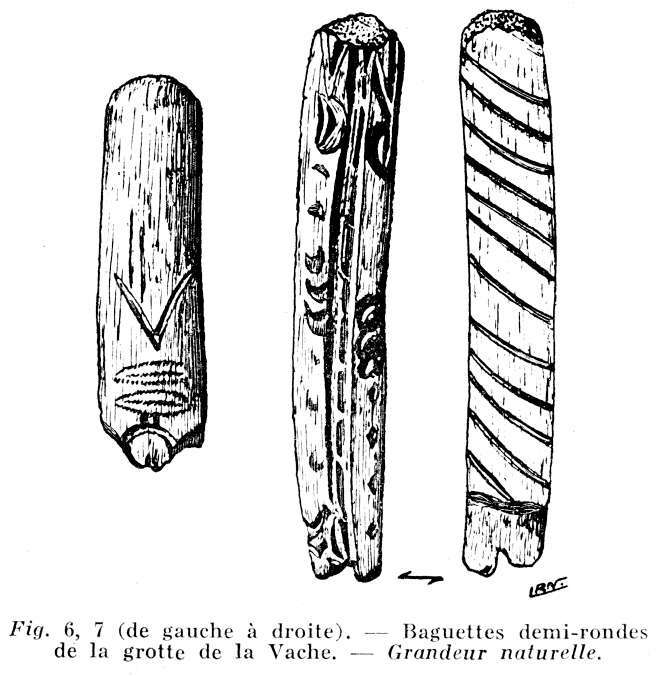 The baguettes demi-rondes discussed here are essentially made of male deer antler, rarely of bone, more rarely of ivory (note that ivory is a material which cleaves by ageing, a spear can thus easily become a 'baguette demi ronde'). Two sites: Enlene (Ariege) and Isturitz (Pyrenees-Atlantiques). - Enlene: Museum of Pujol Ii Montesquieu-Avantes (Ariege). Collection of Begouen, series from the middle Magdalenien, 432 pieces in total. - Isturitz: Museum of National Antiquities at Saint-Germain-en-Laye. Passemard Collection (206 Pieces) and Saint-Perier collection (200 pieces) except for the Saint-Martin room. The stratigraphy is that established by E. Passemard and R. de Saint-Perier. 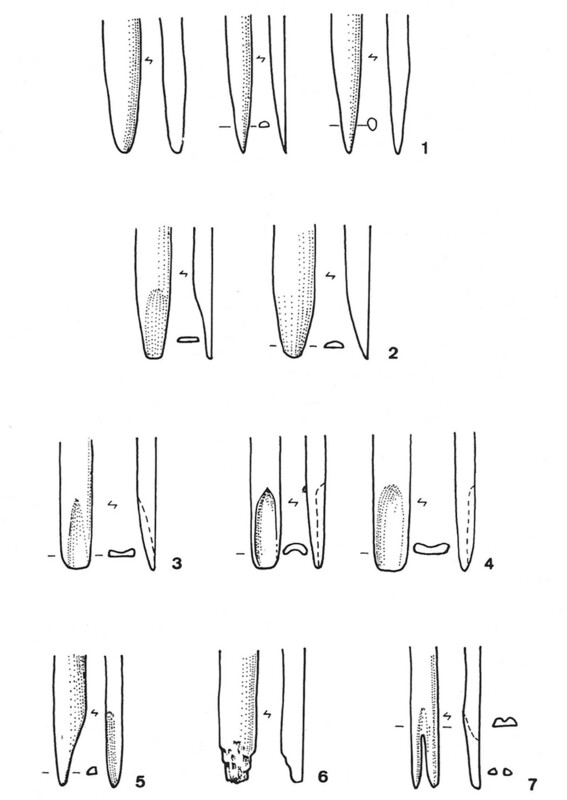 1: Pointing blunt or pointed, cross section round or semi-circular. 3: gutter or groove on the upper side. 4: gutter or groove on the underside. 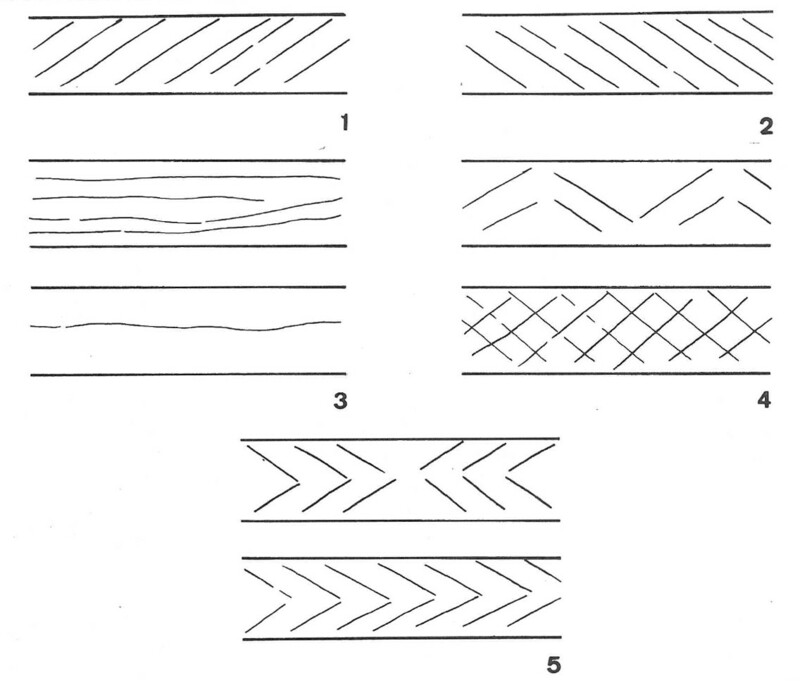 Scratch patterns on the 'flat' surfaces of the baguettes demi-rondes from Isturitz. 1: oblique scratches ascending from right to left. 2: oblique scratches ascending from left to right. 4: alternating scratches, sometimes in a cross hatch pattern. 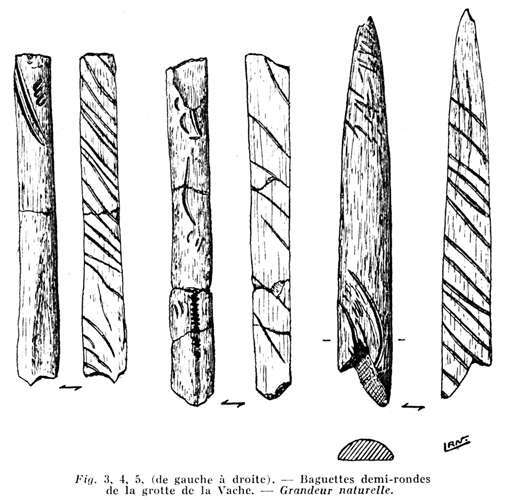 Baguettes demi-rondes from the Grotte de la Vache. Note the carved decorations on the convex side, and the oblique grooves on the planar or slightly concave side to aid adhesion. The baguette demi-ronde on the right has what appears to be a stylised Ibex head carved into it. 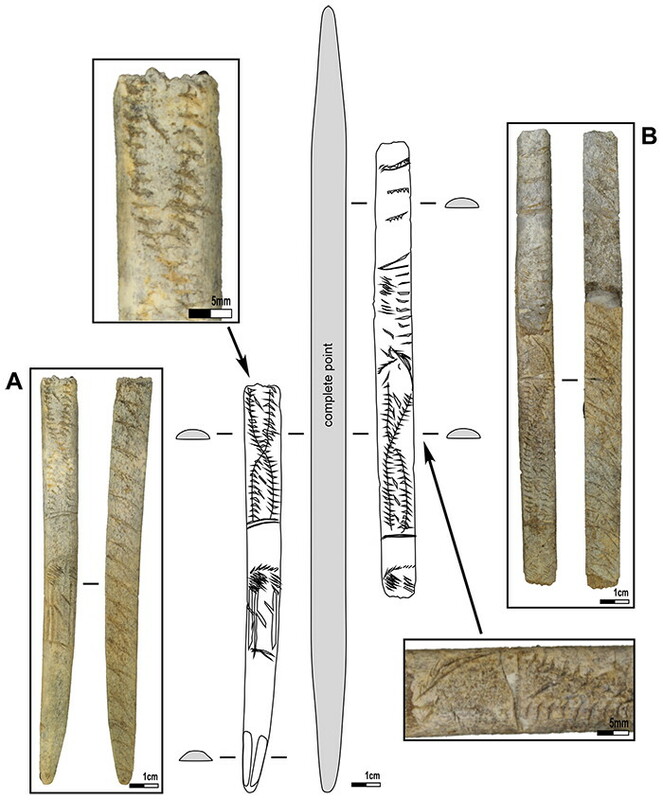 Broken bone rod from La Madeleine engraved with the head of a bear facing a complex phallic form. Upper Magdalenian. This baguette demi-ronde is possibly one half of a projectile point that together with another similar one would form a specific point - a baguette demi-ronde. - Middle Magdalenian. The improvements for industry made to the area in question, and the leveling of the floor of La Grotte de Bédeilhac, have left only narrow strips against the wall where archaeological layers remain. 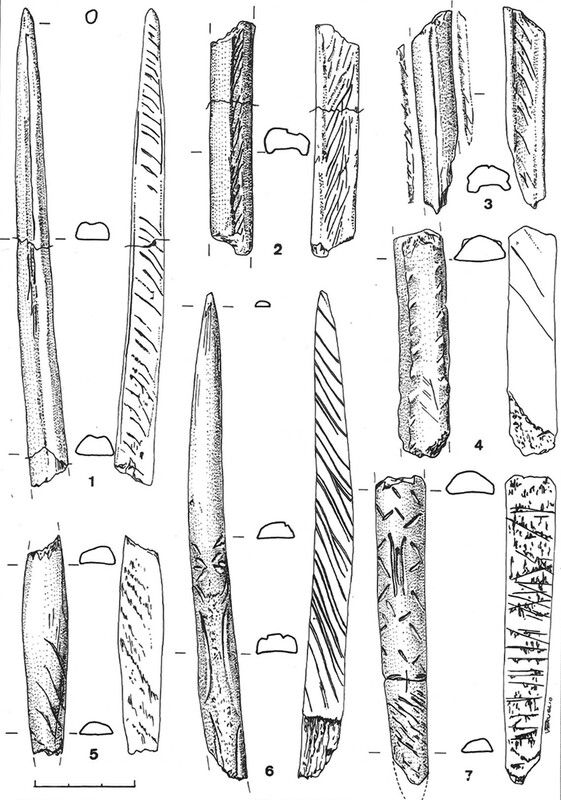 3 cores, a chisel, a discoid scraper; a scraper point, a scraper-burin, two retouched truncated blades, 4 retouched flakes, and a superb burin of 8 cm long in sandstone. 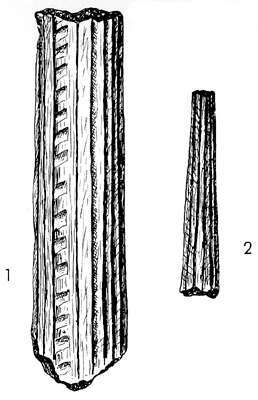 1 - a fragment, 10 cm long, of a baguette demi-ronde decorated with two side bands of lines and eight parallel lines at one end. 1 Fragment of a baguette demi-ronde. Baguette demi-ronde from Laugerie Basse. Half round rod, made from reindeer antler. Plano-convex cross-section tapering to rounded tips at both ends. At one end the point is formed by a bevel on each side, scored with deeply incised, multiple striations. This end is rectangular in cross-section whereas the opposite end tapers to a plano-convex tip. 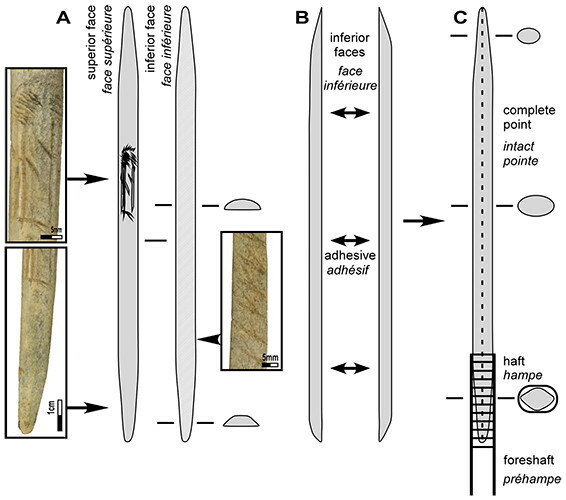 The central area of the convex face is decorated by the alternate removal of patches of antler to leave a raised mid-line with low relief nodules on either side. The flat face is decorated by irregularly spaced, transverse incised lines which are more numerous in the central section than on the tapering areas. Length 123 mm, width 18 mm, thickness 8 mm. 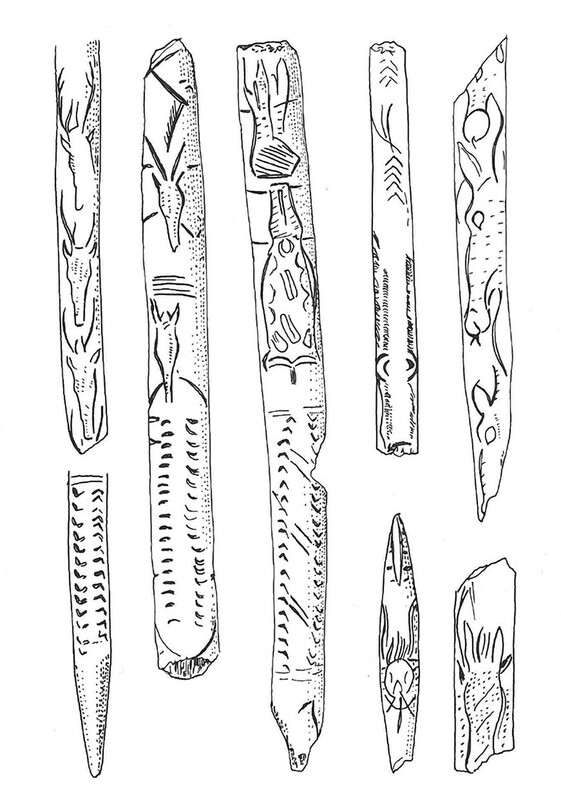 Catalog: Laugerie Basse, Palart.208, excavated by Christy and Lartet in 1863. Antler half rod, plano-convex in section and nearly complete, except for an ancient break at the tip. Obverse surface decorated at the base with a group of longitudinal lines, at the tip with diagonal striations and in the centre with a double engraved line flanked on each side by a row of diagonally-cut pimples. Reverse engraved with two opposing series of chevrons, one of which has a central incision. Length 206 mm, width 17 mm, thickness 5 mm. 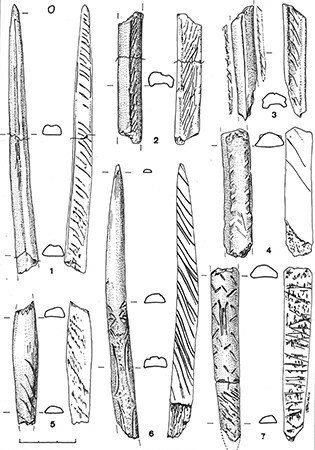 Catalog: Laugerie Basse, Palart.209, excavated by Christy and Lartet in 1863. Baguette demi-ronde from La Madeleine. Passemard, E., 1913: Fouilles à Isturitz (Basses-Pyrénées), Bulletin de la Société préhistorique française, 1913, tome 10, N. 11. pp. 647-649. 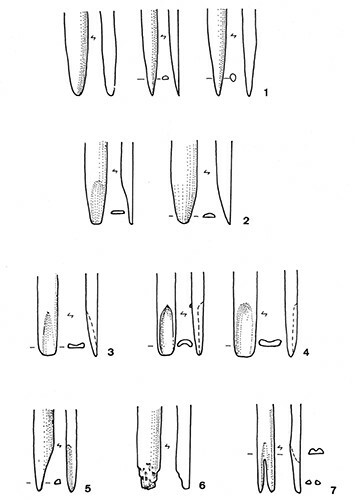 Passemard, E., 1920: Les Spirales de la caverne d'Isturitz, Bulletin de la Société préhistorique française, 1920, tome 17, N. 6. pp. 150-154. Passemard, E., 1920b: Une gravure de lièvre d'Isturitz, Bulletin de la Société préhistorique française, 1920, tome 17, N. 3. pp. 79-81.